Three Rooms Press, 9781941110447, 176pp. For the 100th anniversary of the renowned art movement known as Dada, Three Rooms Press presents the 10th edition of its stunning annual collection of provocative and disruptive Dada-inspired art and writing culled from a plethora of top international contributors, in full color. 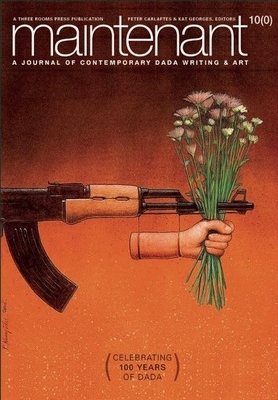 MAINTENANT 10: A JOURNAL OF CONTEMPORARY DADA WRITING AND ART is the latest edition of our acclaimed annual collection. This year's theme, "WARM/HUNGER," features work encompassing artists' and writers' reaction to climate change, global poverty and hunger, ongoing world war and the nationalism, rationalism and greed that has made all of this seem endless and infinite. It features work by a wide range in internationally-renowned Dada artist and writers including punk rock legends Grant Hart, Mike Watt, and Alice Bag, poet and Zapp comix founder Charles Plymell, world-renowned contemporary artists Raymond Pettibon and Mark Kostabi, provocative outsider artists Claude Pelieu and Mary Beach, literary provocateurs Anne Waldman and Andrei Codrescu, and many more. Peter Carlaftes is a screenwriter, playwright, actor, poet, and editor. The author of A Year on Facebook, the poetry collections Drunkyard Dog, I Fold with the Hand I Was Dealt, and Triumph for Rent: Three Plays, he lives in New York City. Kat Georges is a writer, poet, editor, director, playwright, and designer. The author of Punk Rock Journal and Our Lady of the Hunger, she lives in New York City.